The application can be submitted up to and including Wednesday, 7 November 2018 via Creative Industries Fund NL's online application environment. 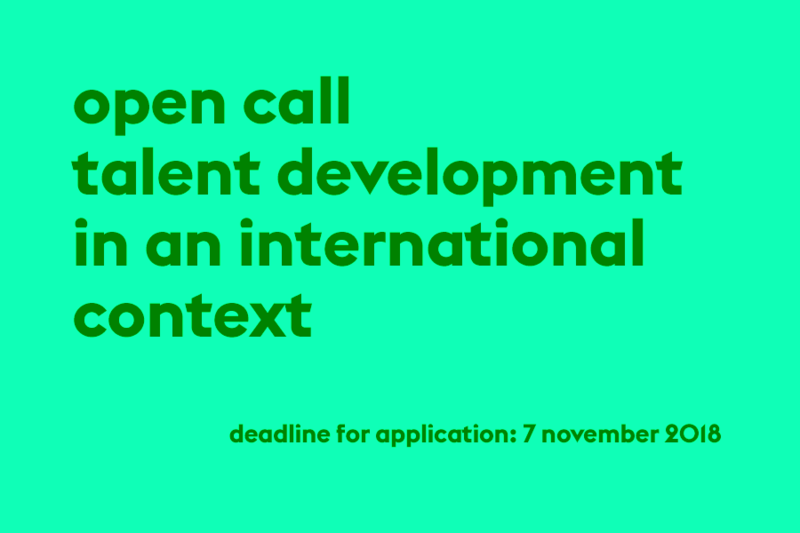 Select 'Open Call: Talent Development in an International Context 2018' from the pull-down menu. 3. CVs of the parties involved, with relevant information about experience that is relevant to the proposed project (max. 2 pages). 5.	proof of registration with a Dutch Chamber of Commerce (KvK) or a foreign equivalent. If the application fails to satisfy the description outlined above, it cannot be put forward for evaluation. Apply for your login for the online application environment in good time and familiarize yourself with the application form. The validation of a new user account can take up to one working day. You will receive a confirmation of receipt by e-mail within one week after the deadline. In order to receive a grant you must be registered with a Dutch Chamber of Commerce (KvK). strengthens the international reputation of contemporary Dutch creative industries. the extent to which it is relevant for the Netherlands. The evaluation takes the form of a tender: a number of proposals will be prioritized within the available budget. Creative Industries Fund NL has allotted a maximum of €125,000 for this open call. The maximum grant per application is €25,000, including BTW/VAT where applicable. The grant is emphatically intended for international activities that contribute to the artistic and/or professional development of designers, creatives, critics and/or curators who are active in the creative industries. Applicants will receive a confirmation of receipt by email within a week of the deadline. The selection of the proposals will be announced by e-mail. The Fund will strive to make its announced by mid-December 2018 and will contact the selected parties. The Open Call procedure is described in the Fund's General Subsidy Regulations. There is no opportunity to submit a draft proposal to the Fund's secretariat for advice. For questions about the open call and procedure, please contact Anselm van Sintfiet by e-mail: a.vansintfiet@stimuleringsfonds.nl, or by phone: +31 (0)10 436 1600.